Product #12274 | SKU 0370-001-190 | 0.0 (no ratings yet) Thanks for your rating! 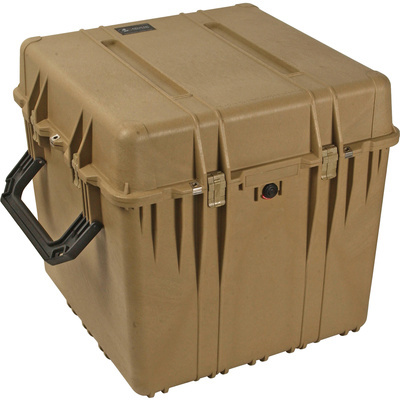 The Pelican 0370 24" Cube Case with Foam (Desert Tan) is an extra-deep watertight, airtight, dustproof, crushproof case. The case is made of Ultra High Impact structural copolymer that makes it extremely strong and durable. It has oversized haul handles on each side, which allows two people to use two hands on each handle to lift and carry heavy loads. The case is closed by six ABS double throw latches (two on each side and two in front), maintaining a watertight seal. The cube case is stackable for convenient storage. This case has a seven piece foam set included.